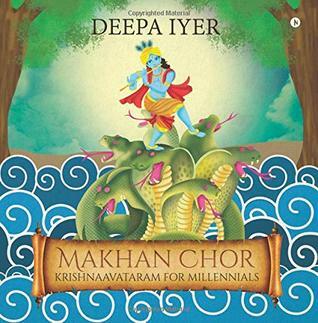 Makhan Chor by Deepa Iyer is inspired by Lord Krishna's life. This is my second read from the author. The first one is The Tree of Values. I like the cover page. The plot based on winning of good over evil. We all heard the stories of Lord Krishna in our childhood. The Lord kills Kansa, his maternal uncle. He also teaches us the meaning of true love and selfless friendship. This book gives a short description of almighty Krishna's life events. The book is short and quick to read. I feel the formatting could have been better, but the language is uncomplicated. The book is illustrated by eye-catching pictures. The children will definitely love this book. I basically relive my old memories after reading this book. Lord Krishna's tactics always amazed me. The book is divided into three parts. Deepa Iyer's writing has one thing common, she gives moral at the end of all her stories. I recommend this book to every child, but I believe every person will gain something from this book. Lord Krishna is the eighth incarnation of Vishnu. He is the epitome of love and playfulness. The young and the old alike are enthralled by his leelas. All his leelas - be is as the chubby Laddoo Gopal or the adorable Makhan Chor or the eternal lover of Radha or the Supreme Guru -are colorful and filled with mirth. Deepa Iyer desires to drive home some of the priceless values necessary to evolve as a good human being to today's millennial generation. What an awesome way to achieve this by humanizing Krishna through some of his divine leelas! Designed especially for children, the rich, colorful illustrations are expected to kindle their interest and curiosity. The simple language will make it easier for them to read and absorb the lessons through these precious gems. The author hopes that everyone will enjoy reading this version of the epic.